“Tour operator” means any person engaged in the business of planning, scheduling, organizing, arranging tours (which may include arrangements for accommodation, sight-seeing or other similar services) by any mode of transport and includes any person engaged in the business of operating tours”. In the case of Intra-State supply of tour operator’s services, CGST @2.5% and SGST @ 2.5% will be levied making the total tax as 5%. On the contrary, in the case of Inter-State supply of services, 5% IGST will apply on services of tour operators, without ITC benefit. While paying 5% GST, tour operators will not claim CGST, SGST and IGST charged by hotels, transporters, airlines, restaurants, travel agents, guide, house boats, cruise ships, luxury trains, monument entry fees, joy rides etc. as input tax credit. Secondly, GST charged by counterpart tour operator will also not be available as input tax credit to the tour operator. Services provided by house boats (moving) in Kerala and cruise ships, in the opinion of our Association, are also covered as Tour Operators Services. In both these cases, accommodation, food, transportation, sightseeing and other value added services are provided as combo package. Tours conducted through luxury trains like Maharaja Express, Deccan Odyssey, Heritage of India etc. are also covered as Tour Operators Services. Services such as accommodation, attached bathroom, meals, dining cars, bar, lounge, live TV, Wi-Fi, saloon facility, guide, local sightseeing at specified stoppage points etc. are available in these luxury trains. 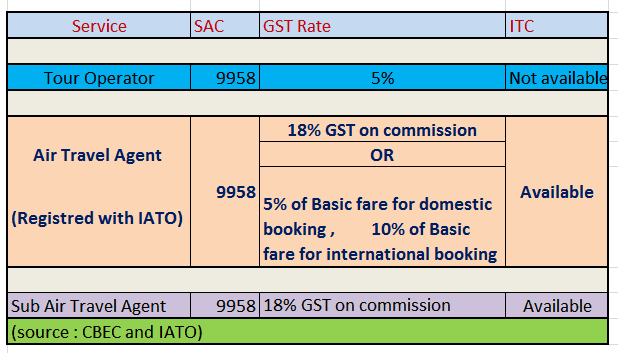 In case an air travel agent opts to pay GST on basic fare module, he is not required to pay GST separately on commission, if any, received from the airlines as well as service charges / booking charges / management charges from the customer / passenger. 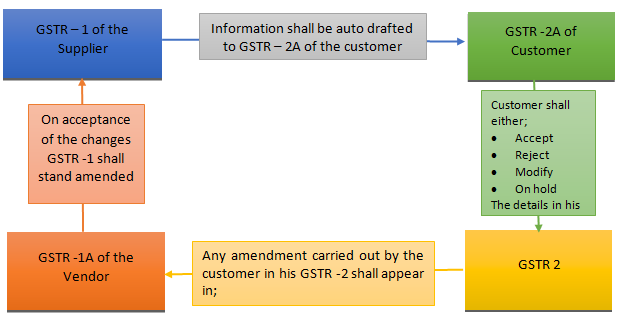 An air travel agent can pay tax under any of the 2 options (para 4.1 or 4.2) on transaction to transaction basis. The rules do not bind the travel agent to opt for any of the options uniformly throughout the given financial year. SAC in the case of Rail Travel Agents is 9967. Nice information. This information is very helpful. Thanks for sharing this huge information. I would like to share with my friends.